He is almost a year old. His birthday is october 14th. He weighs over 60lbs. His dad is red and mom blue--both with solid blood lines. Oh.....Gage's portrait is priceless. He is SMILING. I can so identify with the loving words you have posted. My pit bull Peanut is about 3 1/2 years old, a kill shelter rescue @ 3 months and THE LOVE OF MY LIFE ! I am 63 years old and how delightful to have a "child" back in my home. He is a picky eater, loves to play in the den with us, tears up jack every evening (empties his toy box, chews on his toys, sasses back sometimes) but Peanut shows the love. He cuddles in my lap (all 80 some lbs. of him) gives me the BEST kisses, obeys his commands, snores and "farts" in HIS recliner.....MY CHILD ! My stubborn husband of 46 years WILL NOT let Peanut sleep with us. I am so sad about this. And guess what? Peanut now has a service dog vest and accompanies me to the local stores. He carries a card that states he is a Mobility Dog for me. I have had a undiagnosed disorder for going on 12 years now. My body feels like it is bouncing up & down, my legs feel like rubber. Not fun. But I love the Lord and trust HIS will for me. I have a tendency to fall )several ER trips and 2 surgeries) and my Peanut is so strong...I can depend on him not to let me fall if he feels me leaning, stumbling, etc. Peanut is my ROCK. He is giving me so much joy in my senior years. Continue to love Gage, pamper him and "show the love" for his breed. 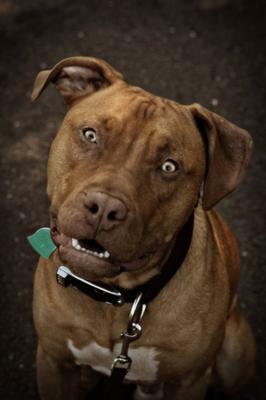 I am a pit bull advocate and I have a group on Facebook called "Pit Bull Owners Unite". May God richly bless you and Gage ! thanks :) he is such a sweetie. its funny because after we pick up his toys/bones and put them away in his crate he takes them all out one by one. he knows how to dance and walk on his back legs. he can also sit pretty,shake,high 5, crawl and roll over :) we started teachin him when he was little. Gage nice to meet u my name is Elvira 6 mons old 40 lbs and growing would like to meet u one day I live in THE Republic of madison hope to be moving to the country next year columbia co. hopefully if I can find a house w/ a big yard or land so me and my big broter & sister can run. The city of Madison has banned us from going to all the dog parks in Mad Town.